With RepairDesk you can easily introduce a new item to the existing inventory. You can add accessories, parts or mobile phones, trade In device and casual items. 3. 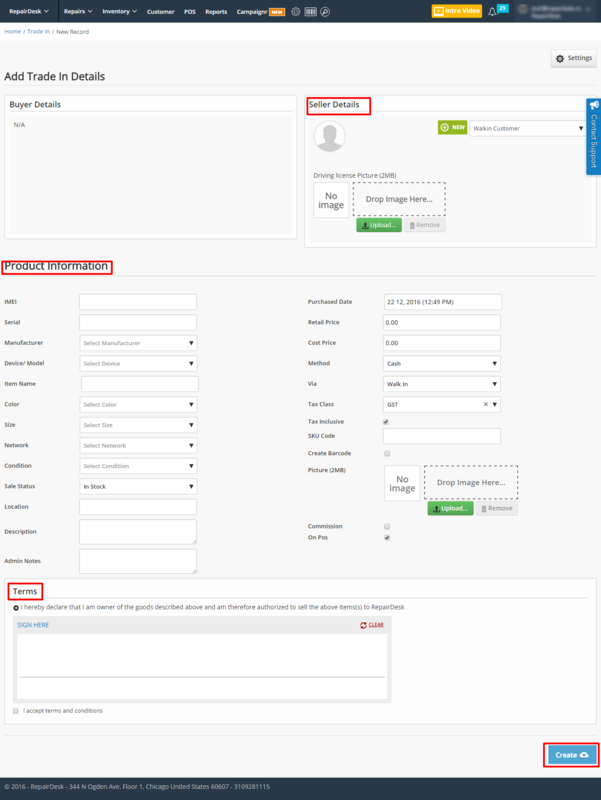 Enter information such as item type, name, manufacturer, device and warranty under the Product Info tab. 4. Enter information such as stock quantity; re-order level, supplier and physical location under the Stock Inventory tab. 5. You can set retail price, sale price, and cost along with tax class under Prices tab. 6. Finally, click on Save Item button to add an item to inventory. 1. Go to Inventory >> Manage Inventory >> Trade In. 3. Enter seller’s information in the Seller’s Detail section. 5. Get seller’s signature in the Terms signature and hit Create button. 1. Go to Inventory >> Manage Inventory >> Casual. 3. Enter item name, description, price, cost, tax and other relevant information. 4. Click on Create to add a casual item to inventory.